If you are a longtime boat owner, you know that owning a boat is a costly affair. Making decisions that keep not only the cost of your initial purchase, but also the long-term cost of ownership, well within you financial means is one of the critical factors of keeping the pleasure in boating. Its very hard to enjoy your boat when it becomes an unexpected drain on your financial resources. If you're buying your first boat, or are making a considerable step up in size, the following are some important points that should be carefully considered to help you achieve maximum enjoyment from your purchase. One of the most important considerations is keeping the total cost of your purchase well within your financial means. One of the considerations often overlooked when purchasing a new boat is what the vessel will be worth a few years later in the event that you suddenly need to liquidate. We all know that the moment we drive a new car out of the dealership, it immediately loses 25% or more of its value. And although the immediate depreciation rate of most new boats is not quite so bad, the owner of a newer vessel is going to take a serious hit in the event that he has to suddenly sell. There's a good reason why banks want a 20% down payment on financing. One of the worst positions you can be in is to have to liquidate and finding that your liability is more than your equity. This is especially important if you're purchasing a used vessel. Bank repossessions hit an all-time high in 1992 and the majority were older rather than newer vessels. We seem to be living in an age when price and quantity are more important to consumers than quality. First time buyers in particular are often more interested in finding the largest size vessel for the least cost. This is a mistake. Boats float in a very corrosive fluid: sea water. Added to the corrosive effects of sea water are the effects of sunlight, ice and snow, rain and the rough conditions of oceans, lakes, and bays. In other words, boats float in a rather hostile environment, a factor that should make getting the best quality for the money a primary consideration. Increasingly, boat builders are succumbing to marketing fads, sacrificing quality for appearance, style over safety and function. More and more builders turn to designers of fashion in an effort to snare the inexperienced into keeping up with the Joneses with the latest stylistic offerings. Succumbing to style over substance can be a costly mistake when, a few years later, when the trendy design is out of style and all that showroom glitz and gloss turns to rot and rust under the effects of the harsh marine environment. There is no more instructive exercise than by taking a tour through a marina or boat yard and observing what boats look like after they're a few years old. Their age can be easily determined from the hull number on the stern. Take a look at how those glittering showroom finishes are holding up in the real world. Has the gelcoat turned chalky after only a few years? And what about those fancy graphics? Is the paint fading or is the taped-on feature striping peeling? How about molded plastic parts: are there numerous plastics that are cracked, chipped or broken? Look out for plastic trim and particularly window moldings. Are they painted and is the metal under the paint starting to corrode? Look at the hardware. Is it quality stainless steel, or cheap cast aluminum or "pot metal" parts that are corroding badly? Is some of the hardware painted and the paint starting to come off? Check out the rub rails, for here is one of the better gauges of quality. Are the rails all bent up, loose and distorted, or are there numerous cracks along the hull-to-deck joint? If so, this is a prime indication of poor quality and that the boat is likely to leak excessively, resulting in damage to the interior. Are the outsides of the window frames smeared with caulking, indicating leaking windows caused by a weak and flexible structure? Does it have window frames intended for recreational vehicles, made of non-marine aluminum? See also Windows, Windows, Those Leaking Windows. One of the more insideous side affects of a poorly constructed boat are water leaks into the interior. The interior of this 5 year old boat is completely ruined after the owner couldn't stop the leaking, despite numberous attempts. The fact that the entire interior is upholstered didn't help. And what about styles du jour, the marine equivalent of the bubble car? Are you willing to invest $150,000 in a brief fashion statement that, in a few years, will leave you holding the bag because the style is pass when you go to sell? Are the decks so rounded that you cannot possibly stand up on them. See also Bubble Decks. Is the open cockpit the equivalent of leaving the 1972 Cadillac convertible outside with the top down, an upholstered lounge sitting out the rain, salt and sun? How is all that vinyl covered plywood and plastic going to look a few years hence? This is one of the best ways that I know of to find out how any particular builder's models will hold up over time. Remember that inferior materials such as molded plastics, vinyls, plywood decals, cast aluminum and other painted metals can rapidly degrade, and once degraded cannot be restored. Poorly constructed boats are a lot like particle board furniture: once it deteriorates, there's no bringing it back. The costly investment turns into a painful loss. Remember that the reason why quality boats like Hatteras, Tiara, Bertram and Viking cost so much is because of the quality materials that go into their construction. There's a good reason why they don't put interiors on the exterior! A 20 year old Bertram can still be easily resold because its quality components have not turned to dust. If you want to avoid taking a big hit on resale, remember that the glitz and glitter today is less important than how your purchase will look at the time you go to sell. Most upholstery found in open cockpits consists of vinyl over some type of wood, usually cheap plywood. It collects water and can rot away in only a few years as it has done here. All the beautiful upholstery in this cockpit was destroyed by mildew. The owner said he thought these materials were designed to stand up to the weather because they're used on the exterior. Consider your option of new or used carefully. There are very good values to be had in used boats. More first time buyers purchase new boats, while experienced boaters more often buy used. And with good reason. Experienced boaters know that there is better value dollar for dollar in many used boats than new ones. They've already had the experience of taking a big hit in depreciation, along with the high cost of financing involved in a new boat purchase. To help decide which is right for you, consider the following. When we track the depreciation curve for many of the most popular builder's models by determining the net annual loss in resale value, we find that the higher the vessel quality, the sooner the depreciation curve will flatten out. That means that higher quality boats proportionately lose less value than lower quality vessels. For the above mentioned builders, the flattening out usually starts around five years, so that by the time a vessel is 6 years old, the annual loss of value is only a few percentage points. If you truly want to know what the annual cost of ownership is, add in the total principle plus interest to the annual operation and maintenance costs. Then, simply subtract the anticipated residual valve and divide by the number of years owned. For a new boat, this can be an enormous sum each and every year. Perform the same calculation for the purchase of an 8 year old vessel and the cost of ownership comes to only a fraction of that of a new vessel. A general rule of thumb is that a new boat purchase works out better for the owner who keeps a boat longer than the average four years, or at least through the bottoming out of the depreciation curve. Obviously, the longer a boat is owned, the less the annual cost becomes. However, that doesn't help much as far as residual value is concerned unless we consider the original cost versus anticipated resale value. Once we do this, we understand that what they told us was really true: boats, like automobiles, are not an investment but a major expense. If you plan to only own the vessel for a few years, or you anticipate that there is a chance you may have to sell, by far a used boat will be your better value. Within the size range of 25-35 feet, it is a myth that diesel power is more economical than gas. After about four years, diesel engines become much more costly to own and maintain. When a gas engine goes bad, it can be rebuilt or replaced for a few thousand dollars while we measure the costs of diesel overhauls in the tens of thousands. Unless one plans to get a lot of use from his boat, gas engines are usually a better choice for boats up to 35 feet. See also Power Options, Gas -vs- Diesel - Part II. With used boats, don't make the mistake of equating low hour meter readings with good engine condition. For the most part, engine hours mean little because engines deteriorate over time. Engines that are little used, gas or diesel, are often in worse condition for the lack of use. Also, don't succumb to the myth that marine diesels last for thousands of hours. They don't. The average time between major repairs is around 6-7 years. Or, if you want to put it in terms of hours, around 1500 hours. Marine engines deteriorate rapidly in a salt water environment. Good boats with bad engines can turn out to be a good buy when comparing price differentials against a newer boat purchase, particularly for smaller boats, and boats with gas engines where engine replacements are easier. Many buyers find that they can get a good buy in a boat with clapped out engines and rebuilding or replacing them. If you don't mind the trouble, it may be worth making the price comparison. If the price works out, you end up with a boat with new engines, a real comfort to any boat owner. While used boats can represent good value, this is true only up to a point. The problem with some boats once they get beyond 10-12 years is deferred maintenance. It is an unfortunate fact of life that many boat owners cut a lot of corners when making repairs, additions or improvements. This is particularly true when it comes to mechanical, electrical and plumbing. While the interior may be beautiful, major systems may have been ignored. On good quality boats, repairs are often done to a much lower standard than the original, so that by the time a decade has gone by, there may be a lot of substandard maintenance and jury-rigging. On older boats, these problems can accumulate to the point where it is no longer economically viable to restore the vessel when considering the cost of refurbishment versus market value. Nothing can take the pleasure out of boating faster than to get in over one's head financially by underestimating restoration and maintenance costs. When experienced boaters make reference to repairs always costing double what they think it will, they're not kidding or exaggerating. Estimating marine repairs is extremely difficult, even for professionals. And nowhere is the statement, "You get what you pay for," more true than in the marine business. Be wary of vessel's with excessive amounts of deferred maintenance or jury-rigging. After the survey is completed, ask a yard to estimate the cost of repairs. If they can't do it, or are having a hard time estimating, chances are that you'll have a hard time paying when the bill comes due. See also All About Buying Used and Older Boats. In addition to purchase price, interest and depreciation, the cost of ownership includes maintenance and repairs, something owners rarely consider. For new boats, maintenance is low for the first three years or so. But after three years costs start increasing significantly. Regardless of type, major machinery will often require major repairs in years 5-7. There's a reason why warranties expire when they do, and that's because that's when the breakdowns begin to happen. If you buy a new 40' motor yacht and sell it after 3-4 years, annual maintenance is likely to average around 4%. The longer you own it, the more it will increase as things wear out and breakdown. The first big hit usually comes when an engine or generator goes bad somewhere between 5-7 years. Obviously, if you own the vessel this long, suddenly the annual average takes a big leap. If you're buying used, then you have to be prepared for this, whether it's an unexpected blister repair job, or some other problem that's not covered by insurance. Of course, with a used boat, that fifty or hundred thousand you saved off the new price more than makes up for "big bill." The point is that in compiling averages, over time we know that costs can be reduced to annual percentages for which an owner should be prepared. For twin screw diesel motor yachts or fishermen, a ten year average will run around 7% annually. After ten years even more. This accounts for all types of maintenance from bottom painting to pump replacements and engine overhauls. Moreover, this assumes that there is little or no deferred maintenance, and for a boat owned since new. If you're getting into a used boat with considerable deferred maintenance, that annual average can increase dramatically, especially when serious problems gang up on you all at once. Marine surveyors universally recommend new boat surveys, not just because they want the business, but because new boat surveys often turn up as many defects as used boat surveys. Not only can the surveyor tell you a lot about the quality of the boat you're buying, but he can help you get those problems fixed before you take delivery and head off warranty problems before they become problems. See also More on Cores. Diesel engines over three years old should be subjected to a full survey. Engine surveys are expensive, but the cost is nothing compared to the repair costs you may face. As with any surveyor, seek out the best you can find. Engines over 5 years old should either have a compression test or the injectors pulled and the cylinders inspected with a boroscope. See also It's Got Recent Overhauls!. 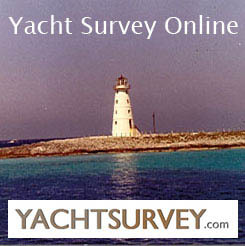 The way to find the best surveyor in your area is to ask people who know and are willing to give you an honest answer. Its a mistake to take recommendations from yacht brokers or others who have a conflict of interest. Insurance agents, company claims offices and yard managers are in a good position to know which surveyors know their business and who aren't in the pockets of brokers. If you want a good surveyor, choose your surveyor carefully. The next most important consideration is to make sure that the surveyor has adequate time to do his job, along with good working conditions. The surveyor can't do a good job if he's being hustled by a broker or seller. Nor can he do a good job if too many people are present on the boat. As the buyer, you should accompany the surveyor so that you're available to see things first hand. Sea trials should be conducted in open water, not restricted waterways. A brief run up a river or the Intracoastal, interspersed with no wake zones won't do. If weather conditions don't permit an open water run, be prepared to reschedule another day. Its extremely important to give the vessel a good run. After the survey, avoid letting a broker rush your decision. They all say that if you don't sign today, they got someone who will tomorrow. Its the oldest con in the book. Surveyors need time to consider their findings, and the survey is not really finished until he has written his report. Most surveyors get their reports done in a day or two, so give him adequate time to finish his job. Make sure that your purchase agreement allows you to cancel the deal if the vessel does not meet your standards. Include a stipulation that the sea trial must be conducted in open water for a minimum of two hours. If the seller warrants that he will repair any defects, make sure that you get that in writing, preferably with a maximum dollar amount attached. It is not wise to allow the seller to repair deficiencies himself. The reason should be obvious, but many buyers overlook the possibility that the repairs that the seller makes may not be satisfactory. Indeed, they often aren't. The best procedure is to negotiate a dollar reduction to the sales price and make the repairs yourself, even if there is an element of uncertainty as to cost. Of course you should get cost estimates on deficiencies, and better still a contract price. If you can't get away from the seller making repairs, at least stipulate in the contract that the repair firm must be mutually agreeable to both buyer and seller. What you're looking to avoid is the shade-tree mechanic who doesn't do the job right. Remember that the broker represents the seller, not you, the buyer. If you want to believe their representations, make them put it in writing. That way you have a contract, not just a sales pitch. Don't be too quick to condemn an otherwise good boat that has a major problem such as a bad engine. If you've done your homework and have researched more than just a few boats, you know what is available and at what price. The old saying that the devil you know is better than the one you don't applies. If you can get serious defects repaired well within economic range, you'll probably end up with a better boat than the next one you look at. The reason is simple: If the problem has manifested, it has become known. When you're looking at boats of comparable age, chances are those boats are also well on the way to having similar problems. Therefore, the more problems that can be discovered and repaired, the better off you'll be. Make quality a major consideration. Don't try to get the largest vessel that your budget will allow. Better to take a step down in size and a step up in quality. If size is a major consideration, seriously consider used versus new as a means of staying within your budget. Look beyond glamorous interiors, luxurious upholstery and racy designs: the beauty may only be skin deep. Seriously consider gas rather than diesel for boats under 35' for which you don't expect to get much use. Once you've decided on several possibilities, take a tour of a marina or boat yard and see how the products of those builders hold up over the years. Talk to their owners and see what they have to say. Consult a surveyor before you buy. Most surveyors will be glad to help you make a choice. Take the time to find the best surveyor in your area. Make your purchase decision only after you've read the survey report. Consider the advantage of getting major machinery or parts overhauled or replaced based on a reduction in price. Last reviewed May 23, 2014.